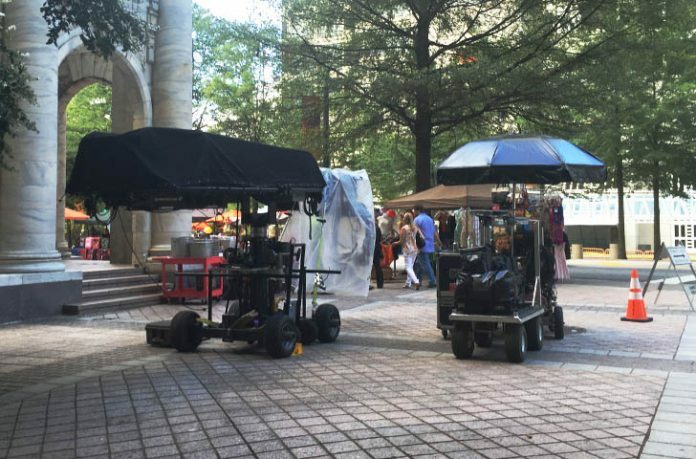 This past month, film crews have been bustling from downtown Atlanta all the way to Lake Lanier. 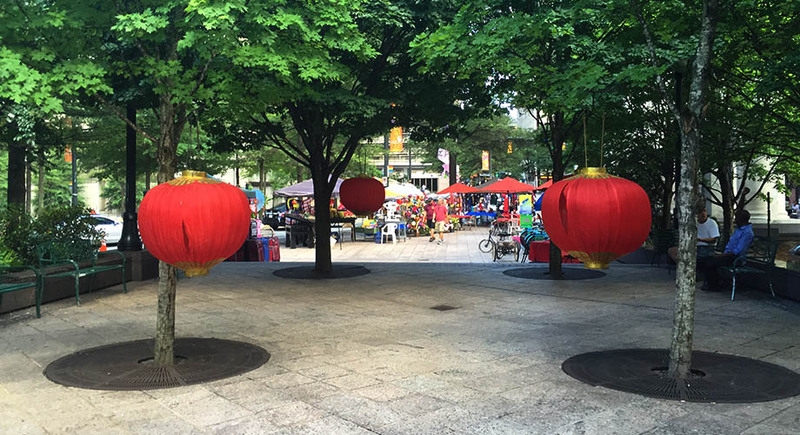 Here’s our monthly recap of what we’ve seen filming around the region. Spider-Man: Homecoming (production code: C) has been the most visible production on the block this month. The movie ended July with a shoot near the Atlanta Motor Speedway. In August, production moved to a set in Sherwood Forest just north of Midtown, with signs plopped on the 17th Street bridge. Crews would stay there until August 6, and later returned from August 15 to 18. A nearby basecamp on 17th and Spring Streets was spotted until August 20. After finishing up in Midtown, Spider-Man took a trip out to Jackson, shooting at the prison outside of town. Most recently, a basecamp was spotted off of Ralph David Abernathy Boulevard and Murphy Avenue, and between August 16 and 23, crews shut down a portion of Murphy for filming. Spider-Man: Homecoming also stars Tom Holland, Michael Keaton, Robert Downey Jr., Marisa Tomei, and most recently announced, actress/singer Zendaya as Mary Jane. And in an “aww”-worthy moment, Holland took a break from the set, donned his Spidey-suit, and visited children at Egleston Children’s Hospital last Thursday. Oprah is quickly becoming a prolific actor here in Atlanta. After filming her TV series Greenleaf earlier this year, she’s back in Atlanta for the HBO original movie The Immortal Life of Henrietta Lacks (HeL). The biopic stars Renée Elise Goldsberry as Henrietta Lacks, who in 1951 became the unwilling and unknowing donor of a tissue sample that would become the HeLa immortal cell line, used for medical research. Filming began this month at Agnes Scott College in Decatur. On August 10, crews were spotted in Castleberry Hill. The following week, shoots took place near Mary Mac’s Tea Room. Signs were placed on Ivan Allen Jr. Boulevard and Peachtree Street downtown. Helen Mirren and Donald Sutherland’s over-the-hill road trip adventure, The Leisure Seeker (TLS) continued production this month. On August 11-12, a basecamp was spotted at Glen Haven Baptist Church, followed by additional filming at a studio near Howell Mill Road and I-75. August 16 brought the movie to the Sonesta Gwinnett Place Atlanta hotel off of Pleasant Hill Road. On August 22, Mirren and Sutherland shot in Marietta Square at a fake Donald Trump rally. Next week, the entire production will move out to Jekyll Island. Jason Bateman’s Netflix series, Ozark (BYRDE), films mostly in Canton, but it did make a few trips closer to Atlanta this month. On August 15, signs were spotted on McEver Road near Lanier Islands. Last week, filming took place in downtown Roswell, with a basecamp near Diesel Pizza and Pub. Monday, the production was in Norcross. The Canton set, the Blue Cat Lodge, was rapidly expanded this month, with several new cabins built on site. Finally this month, we’re watching a ton of solid work rise out of the Hollywood of the South. Fans raved over trailer for Hidden Figures, and Donald Glover’s Atlanta, which premieres on FX in two weeks, is already earning positive reviews. And maybe you’ve heard of a little Netflix show called Stranger Things? Also, there’s a chance we might steal AMC’s latest hit Preacher from Albuquerque. As always, the state of filming in Georgia is strong.